Usage data about various metrics for specific mobile devices, wireless carriers, and platforms (operating systems) that have been used by your app users. There are separate reports for devices, carriers, and platforms. These reports are not generated in real time, but rather, are updated more than once per day. 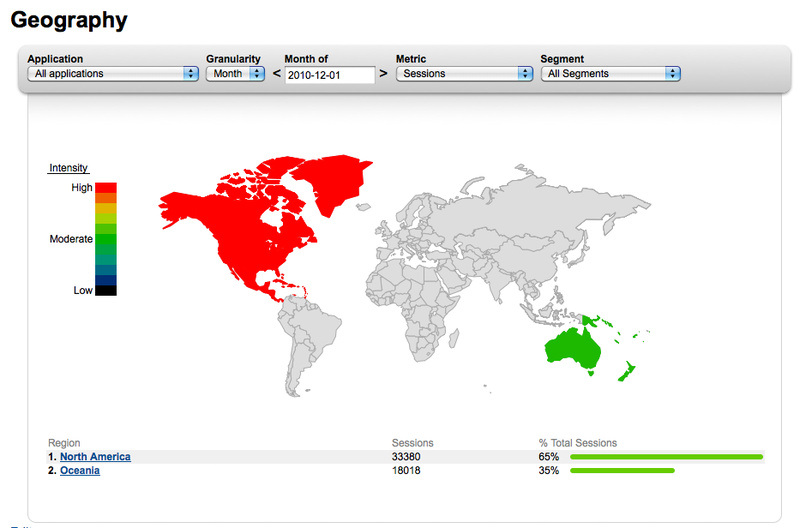 Geography Reports that shows app usage by geographic regions and countries. 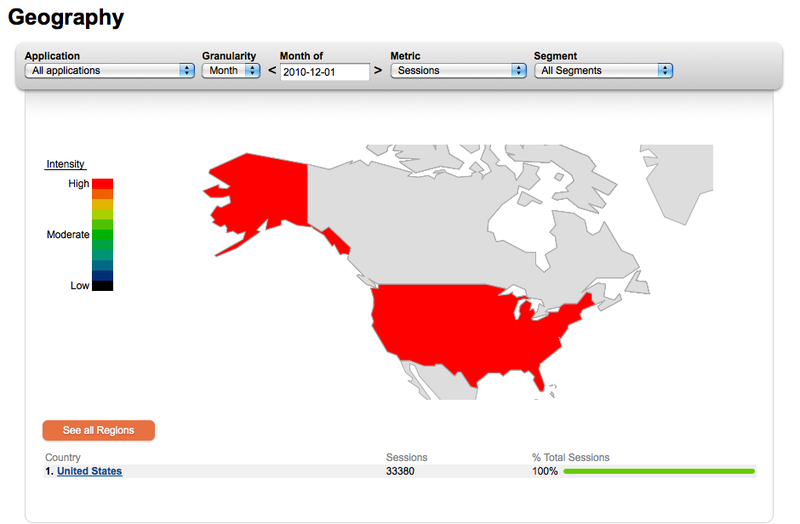 Granularity – Sets the time period for viewing your data. 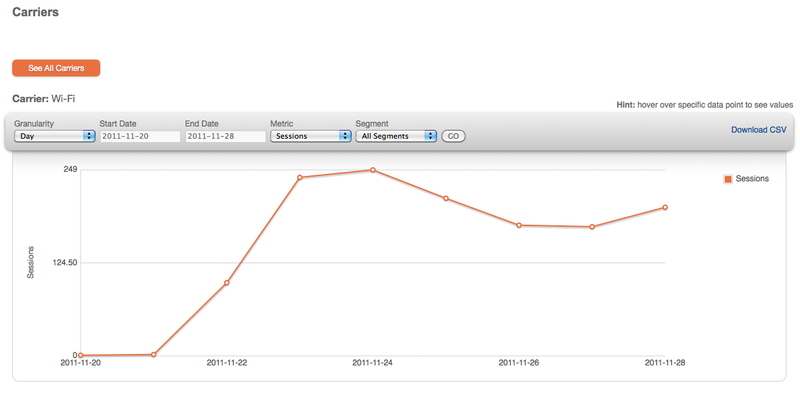 You can select to view your data aggregated by day, week, or month.application. Segment – Select the global segment for which you want to view the data. You can also look at data for first time and repeat users. Clicking on the Name in the all device/carrier/platform report will bring you to a detailed report page (see below) for that device/carrier/platform. The report will provide a graphical chart for looking at specific metrics. Session Frequency — A histogram showing the distribution of users and their number of sessions. Geography reports provide usage data about various metrics for specific geographical regions and countries within which your users have used your app. The geography report will show a geographic map of the world and a report detail table (see below). The top-level report shows app usage data for each major region in the world, if data has been collected for a country in that region. The map shows a heat map of activity with respect to the selected metric, ranging from high to low. The detail table will show the name and data for specific region with respect to the selected Application, Granularity, Date/Month, Metric, and Segment. Clicking on a region in the top-level geography report will drill down in to that region and show you data for all of the countries in that region (see below). The data shown will be the same type as you would see in the top-level geography report. Click on the See All Regions button to return to the top-level report.